What might you be dancing towards, this Valentines week? 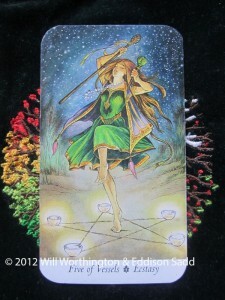 Dancing towards a new life, taking care of your responsibilities along the way, is what The Wildwood advises this week. Doing that with my help is possible. The Wildwood isn’t being humorous or funny this week, it’s being very direct and honest. Typical Wildwood! Dancing through life is like baby steps, you keep moving, slowly, in the general direction you want or need to go. Sometimes, you take a break and take the time to not be dizzy, but not always. When I pulled these cards, I had just separated the boys from squabbling over Minecraft. Can someone take me away from all this, right now? (haha!) Looks like their squabbling is what I’m going to be dancing through this week! When I got back to my sofa seat, this was the thought I had: Dance your way through this week, take care of the important stuff and begin the next chapter, mentally afresh and without the drag of the past. 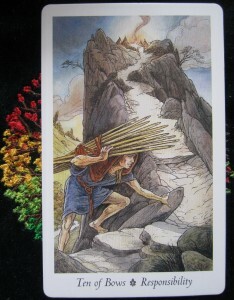 How often are we unable or unwilling to start something new, because we have the past dragging us back? It’s hard to feel happy when you can’t move on from the past. The Centre card is the key to this little storyboard. The other two pivot and dance around it, taking the responsibility it represents, seriously. If you look closely, this fellow is near the top of the hill, finishing off his climb. The fire burns at the top of the mountain, where a few houses or shacks sit. He’s nearly there, he’s nearly completed his task. He just needs to take a few more steps, finish off the details, cross the finishing line. The last card, the Ace, is all about starting anew. There’s something to be said about one’s health when things are finished, the responsibilities are complete. The burden and weight of it, are all over and done with, so you can start again with a clear head and focus on what direction you’re going in now. How wonderful that the story this week is to “Dance to your new beginnings, taking care of your final responsibilities along the way“. I learned after originally posting this that “It is the Chinese New Year as well as Lunar Imbolc, with a New Moon in Aquarius. 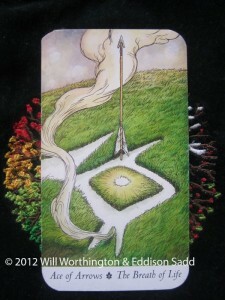 The energy of the day facilitates major life changes.” Amazing how the cards join in with Astrology. Thanks to Lisa Eddy for the astrology info! Thanks also to you, for joining me. I’d love to hear what changes you’re dancing through this week! Ha ha, I actually applied this post to my current challenge: a kitchen renovation project! We have lived in our house for around 9 years, and have never quite gotten round to decorating/improving it. Instead we have done the unseen necessities: new roof, new central heating, new insulation etc. I’ve seen the images on FB! Brave lady! Keep dancing! I’ve seen the images on FB! It’s coming along nicely!